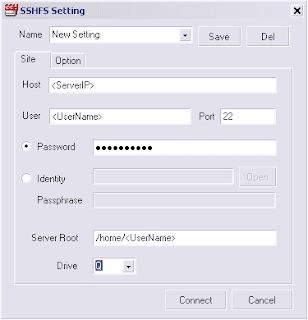 With sshfs you can mount any folder from an SSH Server to your local computer. The big advantace is that the transfer is ssh secure and also the login can be realized over public keys and password. Simple install first the "Dokan library" and after that the "Dokan SSHFS". Open the DokanSSHFS.exe and a new Window will open. Here you can simple setup the needed Informations. It is also possible to use a Keyfile with a passphrase instead of a password, what is more secure. The Drive will be the Letter which you can access your SSH Folder from your Server.